George Groves (19-1, 15 KO’s) confesses that one of the reasons why he wasn’t throwing a lot of shots back at IBF/WBA super middleweight champion Carl Froch (32-2, 23 KO’s) last Saturday night in his 9th round stoppage loss was that he thought that if he let Froch expend a lot of energy that he’d gas out and he’d be able to take advantage of that in the remaining three rounds of the fight. Unfortunately what happened was the referee Howard John Foster saw Groves not punching and he likely figured he was more hurt than he really was so he stopped the fight. You’ve got to put a lot of the blame for the defeat on the hands of Groves for making the decision to let Froch use up energy throwing shots. This was a really bad idea for Groves to make this move in letting Froch exhaust himself, because if he had watched Froch’s previous fights, he’d have known that Froch never tires out to the point where he can’t recoup in the next round. No matter how many punches Froch throws, he’s always been able to come back strong in the next round and keep throwing a ton of punches. Groves made a huge mistake in just letting Froch throw his punches because he hits too hard, and with some referees nervous about not wanting to let someone get hurt, they’ll stop a fight if it looks like one guy is teeing off on the other guy the way that Froch was. Groves needs to watch how Andre Ward fought Froch in 2011. Ward didn’t let Froch just throw punches in hopes of him tiring out. Ward took control of the fight and was either on the inside or the outside out of range. Groves didn’t fight like that. He was always in range of Froch’s shots when he was on the outside, and he didn’t do a great job of fighting him on the inside. That goes preparation. 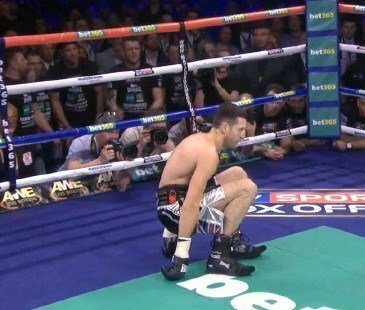 Groves should have hired an extra trainer to teach him how to fight on the inside because he didn’t look comfortable on the inside against Froch, and it was nothing like what we saw from Ward when he fought Froch on the inside.